KIEV, Ukraine -- Valentyn Nalyvaichenko, the chairman of the Our Ukraine party's political council and a former chairman of the Security Service of Ukraine, has said that the communist ideology should be banned. 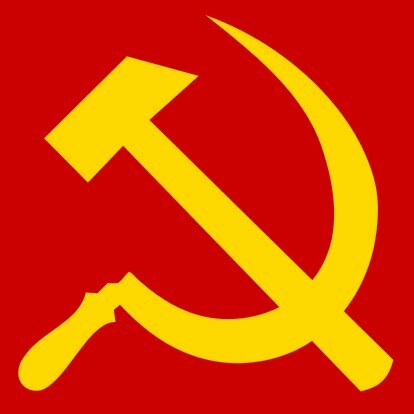 Communist hammer and sickle logo. Nalyvaichenko was speaking on Radio Liberty on November 27. Nalyvaichenko called for the ban while speaking about the additional legal measures that should be taken to punish those responsible for the 1932-1933 famine in Ukraine after a court decision that held Soviet leaders responsible for the famine. "The next thing should be a court judgment on communism and the Communist Party... The communist ideology should be addressed at the legislative level, it should be banned for being the criminal ideology that resulted in the destruction of a peaceful population," Nalyvaichenko said. Nalyvaichenko also said that it was necessary to legally declare the KGB as a criminal organization. At the same time, Nalyvaichenko expressed doubt about the appropriateness of banning officials that cooperated with the KGB from holding government posts in Ukraine because of lack of sufficient evidence. "In reality, most of those archives that could have served as the basis for lustration remain classified and they are in Moscow. The part of the archive that we had is often falsified," Nalyvaichenko said. Nalyvaichenko reiterated that the 1932-1933 famine in Ukraine was an act of genocide against the Ukrainian people and said that the legislation required the Security Service of Ukraine to investigate this crime. "Article 442 of the Criminal Code on genocide stipulates that the Security Service is the main agency that is obliged to investigate and prevent such crimes... Therefore, investigation of this case was not just a whim but my direct obligation as well as the obligation of the entire service," Nalyvaichenko said. In addition, Nalyvaichenko called for payment of compensation to the victims of the 1932-1933 famine in Ukraine for the property that was seized from them. As Ukrainian News earlier reported, the Kyiv Appeal Court ruled on January 13 that the leaders of the former Soviet Union were guilty of committing genocide against the people of Ukraine through organization of the 1932-1933 famine. In November 2009, Volodymyr Viatrovych, the then-director of the Security Service of Ukraine's archive department, also said that the Communist Party of Ukraine should not exist in the country. At the same time, parliamentary deputies Ivan Zaiats and Yaroslav Dzhodzhyk of the Our Ukraine-People's Self-Defense bloc called on the parliament to ban the communist ideology, but the parliament refused to consider the relevant draft law.